This first edition appeared in Collector Editions' Magazine in April 1997 and later in Inside the Vatican Magazine. Julie London and Merna Chance's company was then known as Second Story Studios. 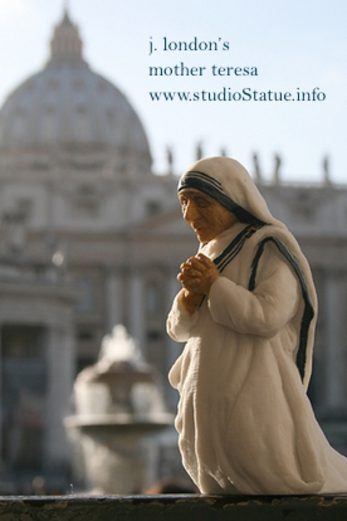 Mother Teresa passed in September 1997, and the studio cast, painted, and shipped 550 pieces around the globe by the turn of the century. The piece was made in a glass sphere and earthen resin. This second edition of 2,800 pieces was produced in 2005 and appeared at the Catholic Marketing Network with Merna Chance. Unable to meet wholesale prices, the piece was quiet for many years and sold only to repeat customers and word of mouth inquiries. Merna enabled many pieces to be distributed through the Missionaries of Charity and Ave Maria University's Mother Teresa Project. Merna completes the master touches on each piece. This edition is made in limestone and resin. This sculpture by American Artist, j. london is available through this online studio and Amazon.com. Merna Chance ships each sculpture to you directly from the studio. See our five-star reviews on Amazon. Merna worked with j. London for ten years at London's small production studio in the USA. 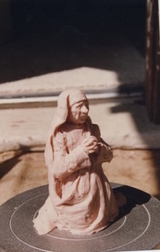 In the early years London made her own molds from which she and Merna cast, painted and shipped each piece. from Merna when your sculpture has shipped. Returns: it is possible within five days, though no one ever has returned this rare piece of Mother Teresa. 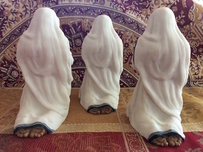 Sculpture produced with permission of the Missionaries of Charity.